A very unique looking Bokhara with tiny motifs in the center. 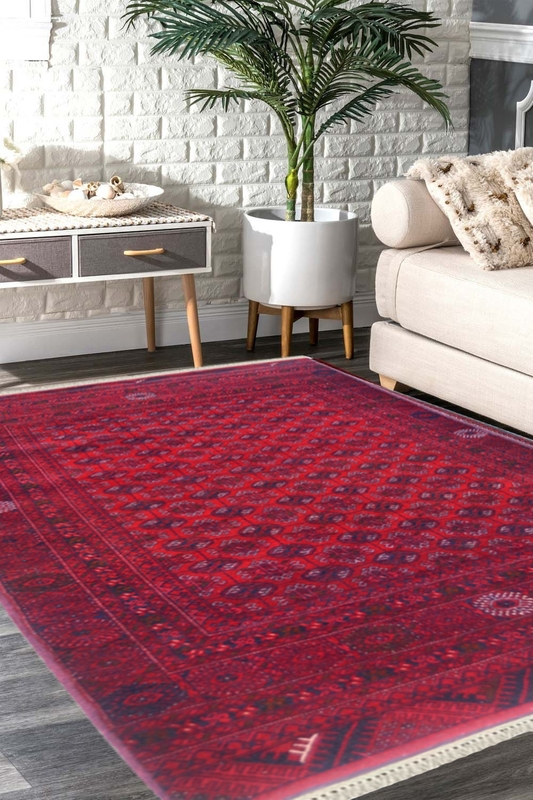 This handmade rug has been lovingly hand-woven by skilled artisans and the tassels have been dyed in herbal tea giving the rug an antique look. This is a gorgeous Afghan Bokhara rug in Maroon with very intricate multi-layered border. The ends of the rug have a geometrical pattern border and the ground is characterized by tiny ivory motifs. Rugsandbeyond prides itself in providing a unique experience of owning an authentic piece of Afghan culture. This rug has high durability and can be used in heavy traffic areas. Bokhara design has been orignated from Persia in 17th century. It looks like the food prints of elephant.